Materials scientists, headed by a team at the Department of Energy's Pacific Northwest National Laboratory, designed a small tube that rolls up and zips closed. These hollow nanotubes are thousands of times smaller when compared to a strand of human hair and have the potential to help with tissue engineering, water filtration and several other applications. The tubes were inspired by protein structures known as microtubules that exist in cells, according to PNNL's Chun-Long Chen. "The structure of the cell is so beautiful," said Chen, a materials chemist who conceived of and directed the project. "We wanted to create a synthetic system that mimics the microtubule structure and is stable enough for a variety of technical applications." Chen, his PNNL colleagues and their collaborators featured their findings in the recent edition of Nature Communications. Microtubules are small hollow tubes that enable keeping DNA organized during cell division and producing highways for shuttling contents around in the cell. These cellular roads are made up of long chains of proteins that gather together into a rigid, but hollow, tube. Microtubules comprise of a uniform but dynamic structure and they indeed inspire scientists like Chen. Chen's group hopes to use small hollow tubes like microtubules in order to develop a robust water filtration system capable of catching salt or other molecules inside and then allowing pure water to escape out of the other end. Furthermore, they also hope to observe how stem cells adapt to varied environments by studying the change experienced by the cells while they grow on these tubes. However, it is not possible for the researchers to use microtubules by themselves for these projects. Microtubules could be responsive and rigid, but they are also susceptible to temperature changes and microbes. For example, "if we want to use microtubules for water filtration, you don't want to have a filter that can be eaten by bacteria," said Chen. Hence, the team set about developing a synthetic version of microtubules by employing protein-like molecules known as peptoids. Like proteins, peptoids are made up of a repeating pattern of building blocks with slight differences, but peptoids are a lot more stable. 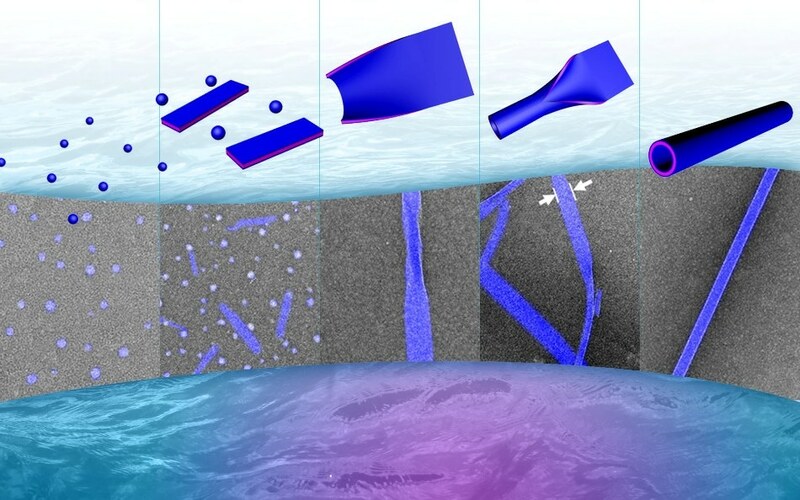 A unique way is created by these new nanotubes. First, small peptoid particles come together to create a sheet. This is followed by the sheet closing at one end and rolling into a seamless tube. In order to characterize the nanotubes, the scientists employed a wide range of techniques, including some at the Advanced Light Source and the Molecular Foundry, two DOE Office of Science User Facilities at Lawrence Berkeley National Laboratory. Chen and his team learnt that these nanotubes are greatly tailorable. It was possible for the group to control a tube's diameter, thickness, size and stiffness by changing the acidity of the solution or altering the tube composition. Chen's team tested the rigidity of the nanotubes by putting pressure on individual nanotubes and then measuring how they changed shape. The tubes contain a rigidity that falls between biological tissue and harder substances like mica and glass, which, said Chen, is great for the experiment varieties he hopes to do. However, Chen does not want to stop there. He aims at developing something that mimics nature in function and structure. Nature has offered us all kinds of beautiful examples. Fish can take in water from the sea without having to worry about high salt conditions. If we could mimic this behavior by building artificial cell membranes containing these nanotubes, we could solve some of the big problems facing our world today. The Department of Energy Office of Science, PNNL and the National Science Foundation of China supported this work.